For other uses, see Tring (disambiguation). 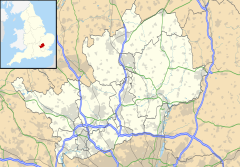 Tring /trɪŋ/ is a small market town and civil parish in the Borough of Dacorum, Hertfordshire, England. It is situated in a gap passing through the Chiltern Hills, classed as an Area of Outstanding Natural Beauty, 30 miles (48 km) north-west of London, and linked to London by the old Roman road of Akeman Street, by the modern A41, by the Grand Union Canal and by the West Coast Main Line to London Euston. As of 2013 Tring has a population of 11,730. Settlements in Tring date back to prehistoric times and it was mentioned in the Domesday Book. Tring received its market town charter in 1315. Tring is now largely a commuter town within the London commuter belt, residents drive or cycle to the nearby Tring railway station. The name Tring is believed to derive from the Anglo-Saxons Tredunga or Trehangr. Tre', meaning 'tree' and with the suffix 'ing' implying 'a slope where trees grow'. There is evidence of prehistoric settlement with Iron Age barrows and defensive embankments adjacent to the Ridgeway Path, and also later Saxon burials. The town straddles the Roman road called Akeman Street, which runs through it as the High Street. Tring was the dominant settlement in the area, being the primary settlement in the Hundred of Tring at the time of the Domesday Book (1086). Tring had a large population and paid a large amount of tax relative to most settlements listed in the Domesday Book. The Manor of Treunga is described in the Domesday Book. It was assigned to Count Eustace II of Boulogne by William the Conqueror. In 1315 the town was granted a market charter by Edward II. This charter gave Faversham Abbey the right to hold weekly markets on Tuesdays, and a ten-day fair starting on 29 June, the Feast of Saints Peter and Paul. It also prevented the creation of any rival markets within a day's travel of the town. The tower of the Church of St Peter and St Paul was built somewhere in between 1360 and 1400. Until 1440, there was a small village east of Tring called Pendley (or Penley, Pendele, or Pentlai). The landowner Sir Robert Whittingham received a grant of free warren from King Henry VI. He enclosed 200 acres (about 80 hectares) and tore down the buildings on the land, returning the estate to pasture, and built a manor house, Pendley Manor. This house was variously inhabited by the Verney, Anderson and Harcourt families until the mid-19th century. The mansion of Tring Park was designed by Sir Christopher Wren and was built in 1682 for the owner Henry Guy, Gentleman of the Privy Chamber to Charles II. John Washington, the son of the Reverend Lawrence Washington and Amphyllis Twigden, was born and brought up in Tring. In 1656 he left Tring to go on a trading voyage to Virginia, but after a shipwreck on the Potomac River he remained in Virginia, married and started a family which eventually included his great grandson, George Washington, the first President of the United States. Tring High Street in the 19th century. The town's prosperity was greatly improved at the start of the 19th century by the construction nearby of the Grand Junction Canal, and soon afterwards in 1835 the London and Birmingham Railway. Industries which benefited included flour milling, brewing, silk weaving, lace-making and straw plaiting. In 1835, the medieval Pendley Manor was destroyed by fire. A local landowner, Joseph Grout Williams, commissioned a new manor house to be built in Jacobean Revival style, and this building still stands today on Station Road. In 1836 Thomas Butcher, a wholesale seed and corn merchant, and his son also called Thomas, established a private bank, Thomas Butcher & Son in Tring High Street. The business was subsequently run by Thomas's[clarification needed] grandsons, Frederick and George, and was also known locally as Tring Old Bank. By 1900 it had branches in Aylesbury, Chesham and Berkhamsted. From this time it became the subject of successive bank consolidations, eventually becoming a branch of the National Westminster Bank, the last to be represented in the town. Walter Rothschild and his carriage drawn by zebras. In the late 19th century the estate became the home of the Rothschild family, whose influence on the town was considerable. Nathan Mayer Rothschild's son Lionel Walter Rothschild (2nd Lord Rothschild, 1868–1937) built a private zoological museum in Tring. This housed perhaps the largest collection of stuffed animals worldwide. As the Natural History Museum at Tring, it has been part of the Natural History Museum, London since 1937. In April 2007 the museum changed its name to the Natural History Museum at Tring in order to make people more aware of the museum's link to London's Natural History Museum. In 1902 the 2nd Lord Rothschild also released the edible dormouse (Glis glis) into Tring Park. He used to ride around the town in a carriage drawn by zebras. In the town centre of Tring there is a pavement maze in the shape of a Zebra's head in order to remember the link that Tring has to the Rothschild family. The former livestock market in Tring, redeveloped in 2005, was believed to be the last remaining example of its type in the UK. It is now the home of a weekly Friday market and a fortnightly Saturday farmers' market. Some of the former livestock pens have been retained. The old livestock market office is now the home of the Tring Local History Museum, which opened in September 2010. In 2008 Tring became a Transition Town[clarification needed] with the support of Tring Town Council. Tring is run by Tring Town Council. The current composition of the Council is: 8 Liberal Democrats, 3 Conservatives, and 1 Independent. Tring contains three wards: Tring Central, Tring East and Tring West and Rural. For elections to Dacorum Borough Council Tring Central elects three members and Tring East and Tring West and Rural each elect one member. On Hertfordshire County Council Tring is represented with one seat, currently held by the Liberal Democrats. Tring is part of the South West Hertfordshire Parliament constituency, currently represented by the Conservative David Gauke. 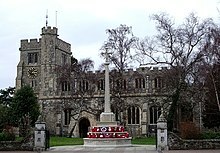 Tring is part of the East of England constituency, which elects seven Members of the European Parliament. Tring is in west Hertfordshire, adjacent to the Buckinghamshire border, at a low point in the Chiltern Hills known as the 'Tring Gap'. This has been used as a crossing point since ancient times, being at the junction of the Icknield Way and under the Romans Akeman Street, the major Roman road linking London to Cirencester. It is transected east and west by the ancient earthwork called Grim's Dyke. It is located at the summit level of the Grand Union Canal and both the canal and railway pass through in deep cuttings. Tring railway cutting is 2.5 mi (4.0 km) long and an average of 39 ft (12 m) deep and is celebrated in a series of coloured lithographs by John Cooke Bourne showing its construction in the 1830s. The four Tring Reservoirs – Wilstone, Tringford, Startops End and Marsworth – were built to supply water for the canal. These have been a national nature reserve since 1955, and identified as a Site of Special Scientific Interest since 1987. Nearby, within the Chilterns Area of Outstanding Natural Beauty that almost surrounds the town, is the Ashridge Estate, part of the National Trust and home to Ashridge Business School. Tring experiences an oceanic climate (Köppen climate classification Cfb) similar to almost all of the United Kingdom. There is a Tesco on London Road, a Co-op on Silk Mill Way and a Marks & Spencer food store in Dolphin Square that opened on 9 October 2007. Tring Brewery has been operating in Tring since 1992. Heygates Mill is a flour mill. Originally it was a windmill, and the company was run by William Mead. The windmill was demolished in 1910 to make way for a wheat storage silo. In those days, Mead lived on site, in a house next to the yard, and owned half the area taken by the mill of today. The remaining space was occupied by boat-builders, Bushell Brothers, who built narrowboats for the canal. The Heygate family took over Mead's business in 1945, and today mills 100,000 tons of wheat a year, resulting in 76,000 tons of flour. This is mainly bakers' flour, but there is also a commitment to wholemeal digestive for biscuits, bulk outlets and a large output of 1.5 kg bags from the pre-packed flour plant. As in the days of Tring windmill, only two men operate the system – but in those days they milled half a ton per hour, and now, with a computerised installation, more than 12 tons an hour are produced. Heygate's Tring mill has 80 employees and 16 trucks delivering throughout the south of England. Pendley Manor, hotel and conference centre. Pendley Manor a hotel, conference and arts centre is situated about 1 mi (2 km) south of the town, near the railway station. Tring is the home of the Tringe Festival. A preview festival in July featuring many well-known comedy acts previewing their new shows before they then perform their shows in Edinburgh. The name Tringe is derived from the host town and the word Fringe. At three weeks long, it refers to itself as the 7th Longest Comedy Festival in the World. Tring is part of the Dacorum Local Food Initiative. Lithograph of entitled 'Tring Cutting' made by John C. Bourne, 1839 showing the excavation to make Tring's segment of the London and Birmingham Railway. Tring railway station is about 2 mi (3 km) from the town and is served by West Midlands Trains services from Milton Keynes Central to London Euston, and Southern operates the cross-London service to East Croydon via Clapham Junction. The station is served by slow and semi-fast trains. The station was originally opened in 1837 by the London & Birmingham Railway under the direction of the railway engineer Robert Stephenson. The remote location of Tring railway station was due to changes to the route of the railway imposed on Stephenson by local landowners such as Lord Brownlow who wished to protect his Ashridge Estate. The location is sometimes wrongly attributed to objections which were said to have been made by Lord Rothschild to protect his land in Tring; in fact, Lord Rothschild was not born until 1840, three years after the railway had opened and the Tring lands were only acquired by his father Lionel in 1872. He did, however, object to a much later plan to build a steam tramway between Tring Station and Aylesbury. Tring railway station was once considered as the terminus of an extension to the Metropolitan Railway (today's London Underground Metropolitan line) from Chesham but this project was not realised. Tring was identified in 2011 as the possible terminus of an extension to the Crossrail lines currently under construction in London, but this proposal has not been approved or funded. In 1973 the A41 bypass was opened. The road runs through Tring Park. The bypass was originally conceived as the first stretch of a new motorway, the A41(M), which was planned to run from the M25 at Watford to Aylesbury, but the project was not realised and the bypass was downgraded to trunk road status. In 1993 the bypass was extended with a further 12 mi (19 km) of grade-separated dual carriageway, linking the short Tring Bypass to the M25. Tring School is a state secondary school and sixth form with approximately 1,500 pupils (ages 11–18). It is located on Mortimer Hill on the east side of the town. It is now designated a Specialist Humanities College with History, Geography and English as its lead subjects. It has had Academy status since September 2012. Tring Park School for the Performing Arts (formerly known as the Arts Educational School, Tring Park) is an independent specialist performing arts and academic school. It is located in Tring Mansion, and has 300 pupils. Tring has four state junior schools: Bishop Wood CE Junior School, Dundale Primary and Nursery School, Goldfield Infants and Nursery School and Grove Road Primary School. Tring has a youth club – The Tring Youth Project – for those between 11 and 18 at the Temperance Hall in Christchurch Road. Tring also has a theatre youth group, Court Youth Theatre which is connected to the Court Theatre, Pendley Manor. This has three sections to it: juniors, intermediates and seniors. That ecstatic Old Person of Tring. Tring Sports Centre is in the grounds of Tring School. Tring is the former home town of Premiership referee and 2003 FA Cup Final referee Graham Barber, now retired in Spain. It is also home to the retired FA and World Cup referee Graham Poll. Sir Francis Verney (1584-1615), English adventurer and pirate. John Washington (1631-1677) great-grandfather of George Washington, the first President of the United States. Sir William Gore (1643–1707), merchant and Lord Mayor of London. Subject of an impressive monument in the parish church. John Brown (1795–1890), brewer in Tring; he built and owned several public houses in the area. Gerald Massey (1828–1907) – poet, literary critic, Egyptologist and Spiritualist – was born nearby at Gamnel Wharf, New Mill, on the Wendover Branch of the Grand Union Canal. Goldfield Mill is a converted windmill in Tring. Lord Rothschild (1868–1937), banker, politician and zoologist. Edward Barber (10 June 1893 – 12 March 1915) was born and lived in Tring and was posthumously awarded a Victoria Cross for his bravery during the Battle of Neuve Chapelle during the First World War. Lawrence Ward, former Serjeant at Arms of the British House of Commons lived at Kingsley Walk, Tring between 1977 and 1999, attending Dundale Junior and Tring Secondary Schools. Julian James, former professional footballer. High Street, Tring, Hertfordshire Architecture by William Huckvale (1848-1936). ^ a b "Tring Geo-type". Hertfordshire Local Information System. Retrieved 5 April 2015. ^ "Hundred: Tring". Retrieved 3 April 2015. ^ "Place: Tring". Retrieved 3 April 2015. ^ "Pendley Manor". Hertfordshire Genealogy. July 2008. Archived from the original on 27 October 2017. Retrieved 27 October 2017. ^ Howard Colvin, A Biographical Dictionary of British Architects, 3rd ed. 1995, s.v. "Wren, Sir Christopher": "probably c. 1680". Remodelled 1872 onwards. A surviving obelisk and temple portico in the park are presumably by James Gibbs, for William Gore (Colvin, s.v. "Gibbs, James"). ^ a b Murray Neil. "The Washingtons of Tring". Hertfordshire Genealogy. Retrieved 3 April 2015. ^ "Our Story". Pendley Manor (hotel website). Archived from the original on 27 October 2017. Retrieved 27 October 2017. ^ "Tring Town Councillers". Tring Town Council. Retrieved 4 April 2015. ^ "Your Councillors". Hertfordshire County Council. Retrieved 4 April 2015. ^ "Tring Cutting". Engineering-timelines.com. Retrieved 2013-10-18. ^ "Chilterns Area of Outstanding Natural Beauty". Chilternsaonb.org. Retrieved 2013-10-18. ^ "'Tring Cutting', Hertfordshire, 17 June 1837". Science & Society Picture Library. Retrieved 5 April 2015. ^ Birtchnell, Percy (1960). "Our Communications". A Short History of Berkhamsted. ISBN 9781871372007. ^ Austin, Wendy; Petticrew, Ian (November 2013). "THE RAILWAY COMES TO TRING: 1835-1846". Retrieved 20 January 2014. ^ Clive Foxell (1996). Chesham Shuttle (2 ed.). Chesham: Clive Foxell. p. 32. ISBN 0-9529184-0-4. ^ Prince, Hugh (2008). Parks in Hertfordshire since 1500. Hatfield: Hertfordshire Publications. p. 270. ISBN 9780954218997. ^ "A41". Motorway Database. Retrieved 21 January 2014. ^ Lear, Edward (1846). A Book of Nonsense. London: Thomas McLean.